Our Rosandro daughter placed today in the qualifier for the Oldenburg Riding Horse Championships in the class for four-year olds. Helen Langehanenberg presented our mare bred by Dr. Hermann Genn and took fifth place in the qualifier today. 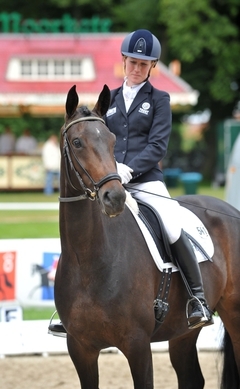 Chocolat and Helen Langehanenberg achieved a total score of 7.92.